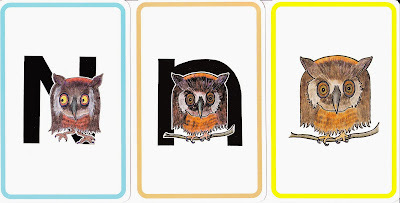 Motion: Using the thumb and four fingers of each hang, make round nightowl eyes and say the letter sound /n/. This was Kai's first week back in school from winter break. He was still trying to get back to his normal routine. On Monday (January 6th), he fell asleep for 45 minutes during music class - signs of jet lag after the long flight back from Asia! He cried during drop-off on the first two days but got better during the latter part of the week. His preschool teacher, Ms Alana, was so proud that he cut the blue egg (on his nest craft) on his own. Kai also surprised me this week in "tracing" the letter Nn! He normally just scribble on the letter but this week, he was more conscious of "tracing" the letter!